The asymmetry parameter g, specifying the degree of scattering in the forward direction ( = 0°), varies from -1 (i.e. all radiation is backward scattered like a "mirror") to 1 (for pure forward scattering). If a grain scatters more light toward the forward direction, g > 0; g < 0 if the scattering is directed more toward the back direction; g = 0 if it scatters light isotropically (e.g. small grains in the Rayleigh regime) or if the scattering is symmetric with respect to = 90° (i.e. the scattered radiation is azimuthal independent and symmetric with respect to the plane perpendicular to the incident radiation). Figure 2. 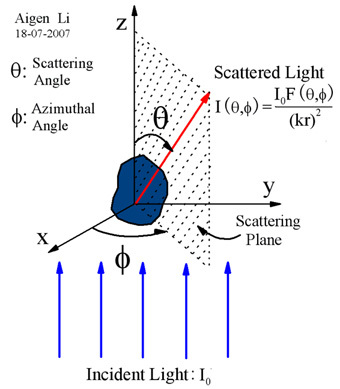 Schematic scattering geometry of a dust grain in an incident radiation field of intensity Io which scatters radiation of intensity I( , ) into a scattering angle ( = 0°: forward scattering; = 180°: backward scattering), an azimuthal angle , and a distance r from the dust. In a Cartesian coordinate system, the incident direction defines the +z axis. The scattering direction and the incident direction define the scattering plane. In the far-field region (i.e. kr >> 1), I = Io F( , ) / k2r2, where k = 2 / is the wave number in vacuum. where is an adjustable parameter. For = 0 Eq. 6 reduces to the Henyey-Greenstein phase function. For g = 0 and = 1 Eq. 6 reduces to the phase function for Rayleigh scattering . The absorption cross section Cabs is the area on which the incident wave falls with the same amount of energy as that absorbed inside the dust; Cext, having a dimension of area, is the "effective" blocking area to the incident radiation (for grains much larger than the wavelength of the incident radiation, Cext is about twice the geometrical blocking area). For a grain (of size a and complex index of refraction m) in the Rayleigh limit (i.e. 2 a / << 1, 2 a |m| / << 1), the absorption cross section Cabs is much larger than the scattering cross section Csca and therefore Cext Cabs. Non-absorbing dust has Cext = Csca. The albedo of a grain is defined as Csca / Cext. For grains in the Rayleigh limit, 0 since Csca << Cabs. For Non-absorbing dust, = 1.
where Cpr is the radiation pressure cross section, and Io is the intensity (irradiance) of the incident light. For spherical grains of radii a, Cgeo = a2. For non-spherical grains, there is no uniformity in choosing Cgeo. A reasonable choice is the geometrical cross section of an "equal volume sphere" Cgeo (3V / 4 )2/3 1.21 V2/3 where V is the volume of the non-spherical dust. 2 When the scattering is along the incident direction ( = 0°, i.e. "forward scattering") or the scattering is on the opposite direction of the incident direction ( = 180°, i.e. "backward scattering"), any plane containing the z axis is a suitable scattering plane. Back. 3 Also called the "differential scattering cross section" dCsca / d F( , ) / k2, it specifies the angular distribution of the scattered light [i.e. the amount of light (for unit incident irradiance) scattered into a unit solid angle about a given direction]. Back. 4 The angular scattering function F( , ) is just the absolute square of the complex scattering amplitude S( , ): F( , ) = |S( , )|2. Back.